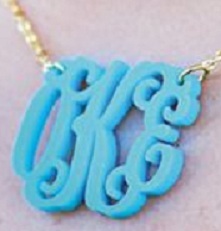 Color Monogram Necklace: Bold Acrylic! What team color are you wearing this Fall? Carolina Clover has your gameday finishing touches with our Acrylic Monogram Necklace! With so many acrylic necklace designers in our collection, we are sure to get you the exact match on your team colors. Click on the following acrylic necklace pics and it will take you to the web site for more information. Necklaces available in script cut out and block cut out acrylics. Shop CarolinaClover.com for your acrylic cut out monogram necklace.